The Newest Rant: Direct Market Woes, Comic-Books at Big-Name Retailers, and the Gruesome Murder of Lois Lane...Wait, What? Direct Market Woes, Comic-Books at Big-Name Retailers, and the Gruesome Murder of Lois Lane...Wait, What? Troubling news and possibly a forewarning? Excuse my mouthful of a headline, but it encompasses a variety of news that has occurred lately and which all weirdly ties together a bit. Basically, there has been more and more discussion of how the Direct Market method of comic-book selling seems to be slowly sapping the life away from the industry itself (to summarize the Direct Market: Comic-stores get a deep discount on all the comics they order ahead of time, but are unable to return them, making it a bit of a dangerous guessing-game if there aren't enough customers who have said in advance what they would like to buy). Combination-retailer-and-journalist Brian Hibbs has written about his concerns before with this 4-decades-old system and is getting especially alarmed as he expressed in his latest column. In my interactions with assorted owners of comic-books stores I have found that many have expressed to me that they are getting to a point where they basically order what their customers with pull-lists/reservations inform the store they want, and then a minimal number of extraneous stuff (besides the most popular-comics) lest they get stuck with a ton of inventory that just sits on the shelves till they have to resort to big sales/throwing a ton of stuff in dollar-bins, losing a bunch of money overall. The Direct Market has been a growing concern for years, but things seem to be heading towards a tipping-point. If the market is fundamentally broken however, what can be done? 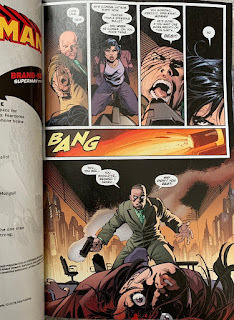 One idea seems to be showing Lois Lane graphically murdered for 12 pages. Keep in mind this comic is geared towards kids and general readers. This is the first page. The first damn page. Okay, that last sentence probably threw you off, so let me explain. DC has been releasing these big mega-comics at Walmart which contain some reprinted stories as well as a bit of new material to entice regular comic-readers to pick up the books too. They usually are near check-out lanes with other random stuff like snacks and trading cards, put there to encourage folk who don't normally read comics to pick them up and give them a flip-through, or hand them to a friend/relative--e.g., "My nephew Timmy loves super-heroes, I'll get him this as a surprise!" This make it odd how in the latest issue, "Superman Giant #7," it contains a story where the first-page is Lex Luthor demanding Lois Lane beg for her life as she defiantly says how Superman will arrive soon to save her. Upon her refusing to beg Luthor brutally shoots her in the head. It is then revealed the comic is about Superman being away from home and worrying about all the terrible things that could happen to Lois without him nearby to protect her from his enemies--so that scene readers just witnessed was a morbid day-dream of sorts. The comic then proceeds to showcase all the terrible ways Lois could die, essentially being a 12-page snuff-comic. This opening tale is written by Tom King, whom I have repeatedly said can write both amazing stuff and things that make you go, "What the Hell?" King just recently defended the story as being a way to show vulnerability and stress in regards to Superman or such, which is all well and good, but maybe doing that via scenes of theoretical vicious murder isn't the best choice in a comic geared toward general-readers and kids. Here's the thing though, if the Direct Market results in many comic-shops suffering decreasing sales and possibly closing, we may end-up with less options for purchasing comics if someone is a consumer who likes to go to a comic-shop (many areas lack even one, after all), and besides buying stuff online folk may very well only be able to buy their comics at Walmart. That, or pick-up weird tie-in books for new toys being released exclusively at Target--although the creative team on that, "Primal Age," comic (Marv Wolfman is involved, to name one person) is pretty impressive considering its a tie-in to Funko-brand toys that look kind of like He-Man rejects. Does a dark future await our beloved comic-book shops? I do not know what future awaits physical comic-books. Will the Direct Market be tweaked into something workable or will it have to be burned-down to the ground for something better to emerge? 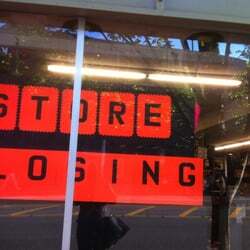 Could a worst-case scenario occur where the potential end of the Direct Market leads to the shuttering of countless comic-shops and people end-up having trouble finding comics anywhere but big-box retailers or online comic-shops? 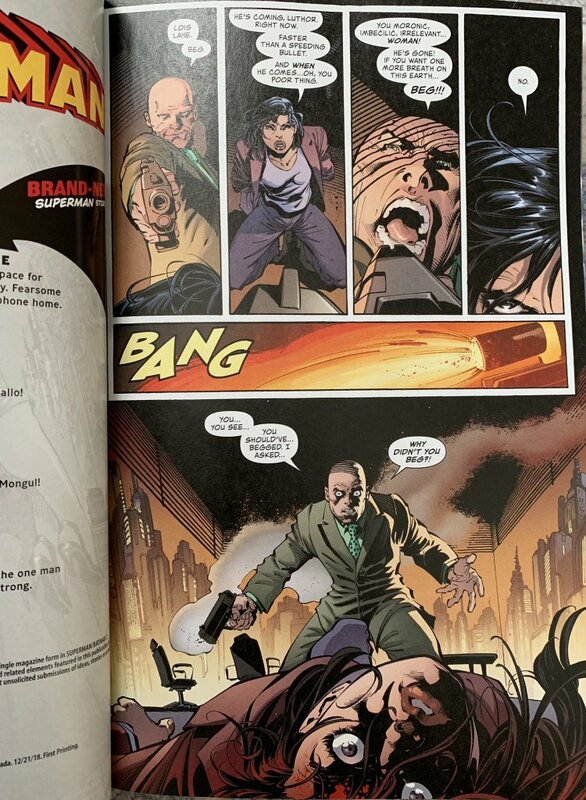 Regardless of what occurs, what kind of comic is appropriate to showcase Lois Lane being repeatedly tortured and killed--besides the obvious answer being: Most likely none of them, because 12 pages of that sounds like bit much. The Direct Market's clock may very well be running-out, and I can only hope when it does reach its deadline that it has a more peaceful ending than the ones imagined by Superman for Lois Lane in, "Giant Superman #7."